City: Soledad Country: Colombia Loan Use: To re stock the business and offer more products to her clients. Margoth is a loving mother living in Soledad, a small town in Colombia´s northern coast. She lives with her husband and their two youngest children. Margoth has struggled all her life to support her family and improve their quality of life. She sells a wide variety of products in her home, sometimes even going into the community to offer her products. With a big effort, she and her husband have been able to build their family home and provide for their family. However, sometimes Margoth found it difficult to restock her shop as she did not have enough income left after her family's expenses. This is why Margoth partnered with Opportunity International, joining a Trust Group, and receiving a business loan. 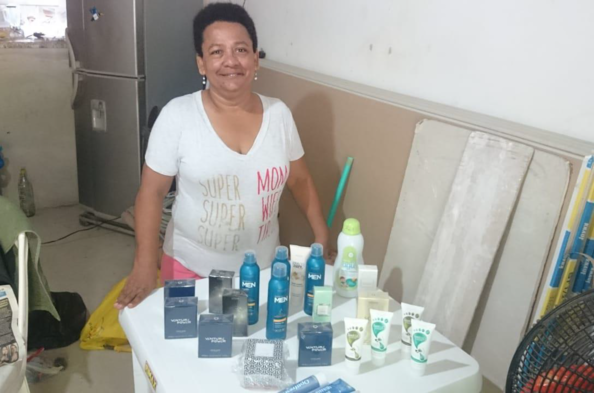 She was able to restock her business and offer more products to her clients. Margoth has found her sales increasing, and she feels closer to accomplish her dream of moving her shop from her home to its own building. Margoth dreams to support her children on their education and to continue improving her home.